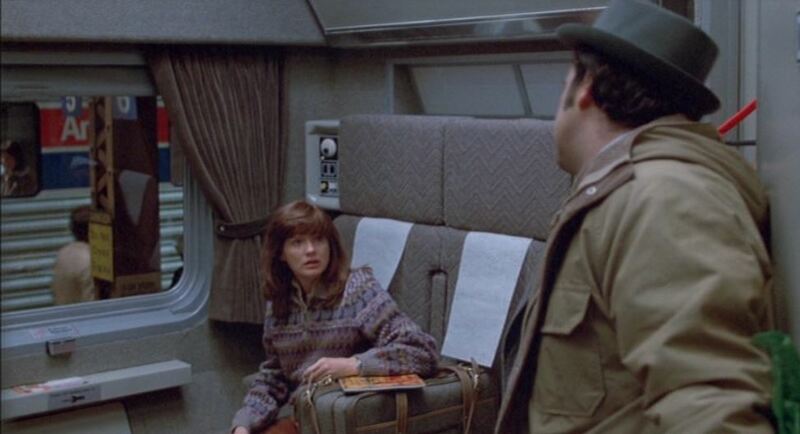 John Belushi’s penultimate (fancy word for “second-to-last”) movie featured a kaleidoscope of early Amtrak era equipment. 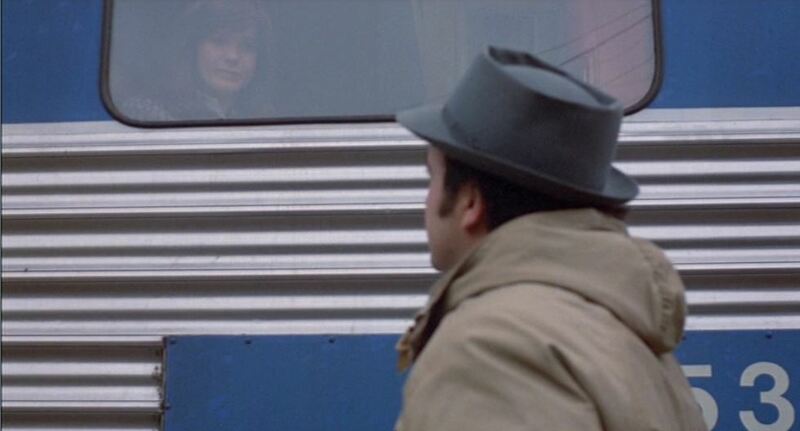 Reporter Ernie Souchak (Belushi) is chasing his love interest Nell Porter (played by Blair Brown) cross country as they journey from Chicago to fictional Victor, Wyoming by train. 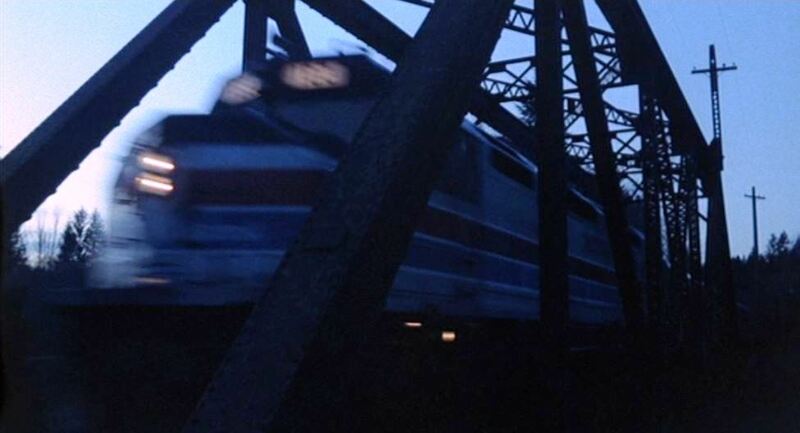 The film’s final 14 minutes contain scenes of 3 different Amtrak locomotives and early “Heritage Fleet” passenger cars resplendent in Amtrak Phase I red, white, blue and silver paint. 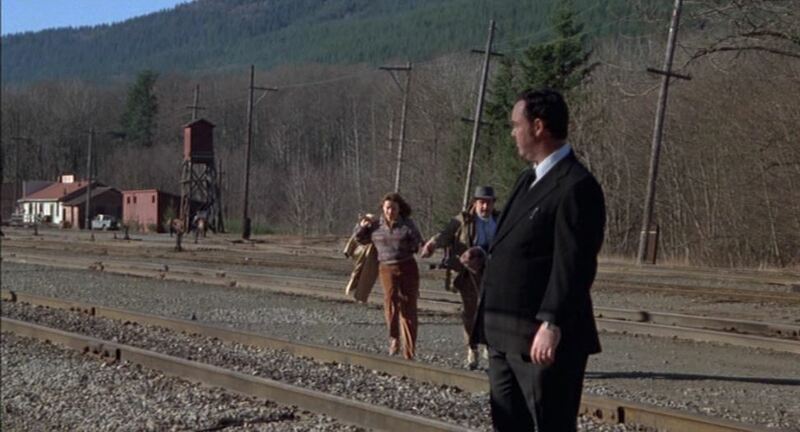 To top it off, the picture’s last moments (Victor, WY) were filmed in little Cedar Falls, Washington on the now-abandoned Pacific Extension of the Milwaukee Road. 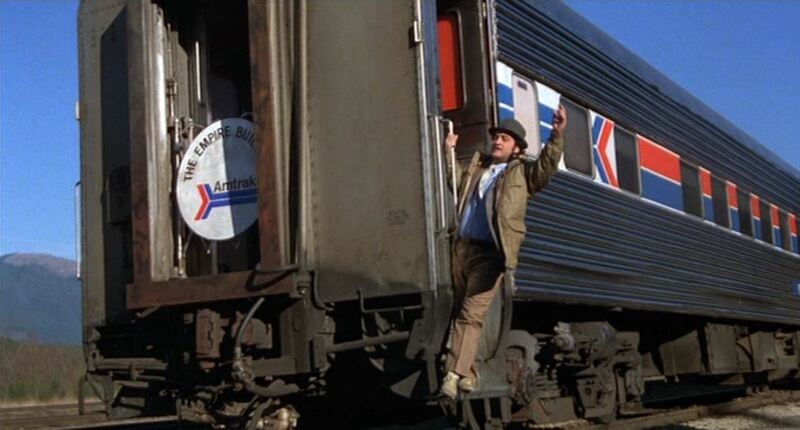 Climb aboard and watch John Belushi play it straight (no wild comedy — this is mostly a chick flick) westbound on Amtrak. 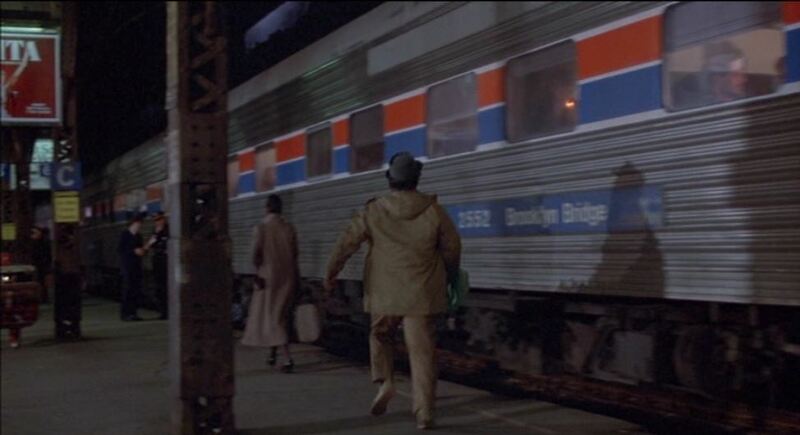 Ernie (Belushi) hustles trackside alongside Amtrak sleeper #2552 “Brooklyn Bridge”. This car started out life as Rock Island Railroad’s #632 Rampart Ridge for service on such trains as the Golden State Limited. 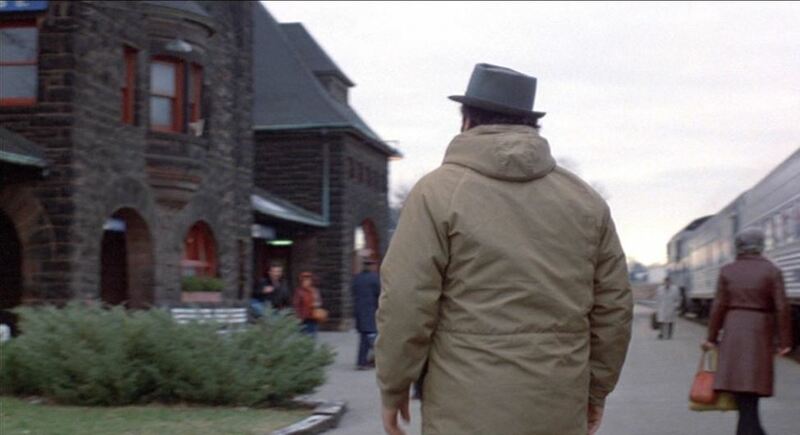 Most of the plot left off HERE. 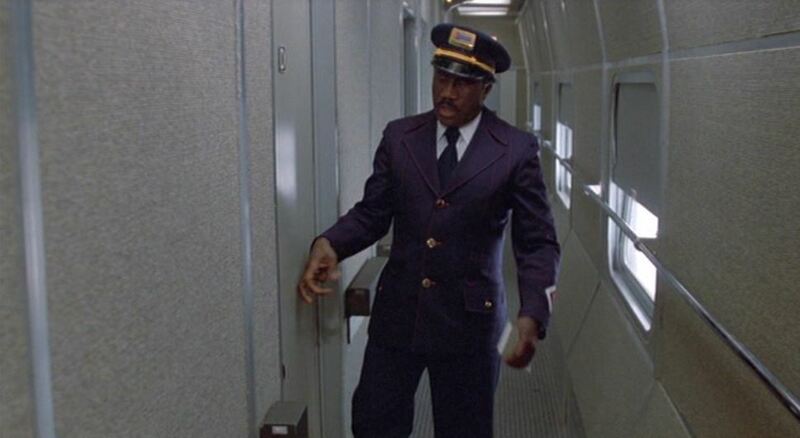 After all, I’m just interested in the railroad stuff…. 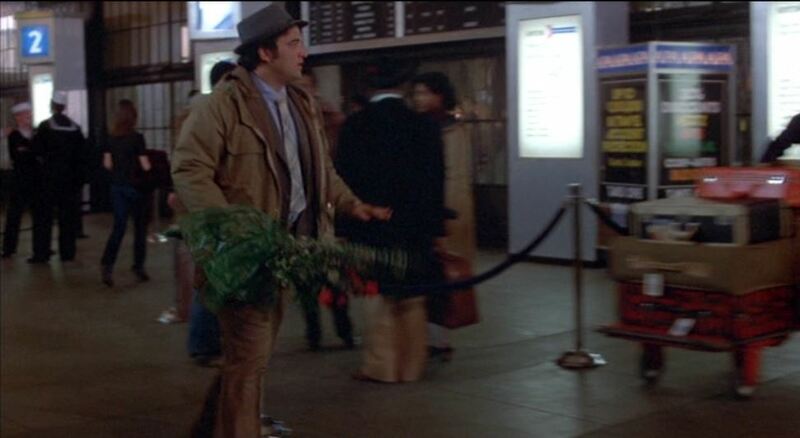 A dozen roses in hand, Ernie dashes through what I believe is Chicago Union Station in search of Nell’s (Blair’s) train. Now trackside, Ernie jogs past Amtrak #2759 “Palm Summit” as well as #2552 “Brooklyn Bridge”. 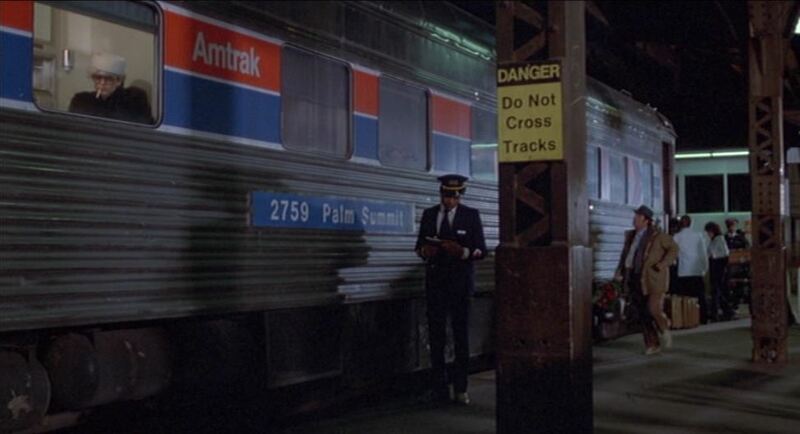 Palm Summit is ex-ATSF #1610 (same name), a 10-6 sleeper built by ACF for the Santa Fe Railway. 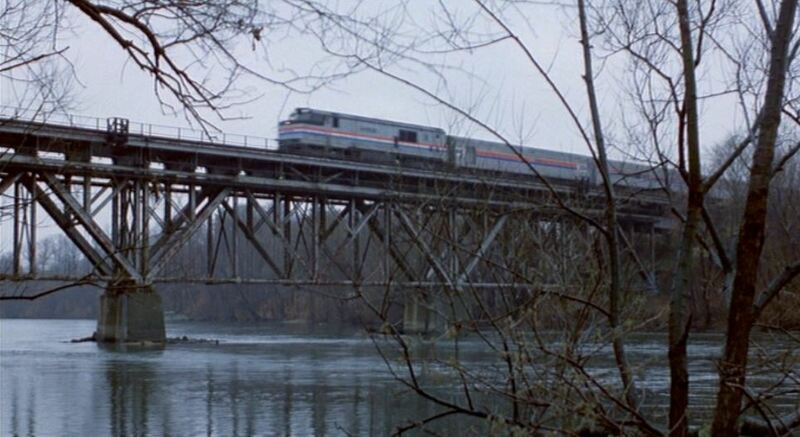 Crossing a river, we get our first view of the train’s motive power and entire 5 car consist. 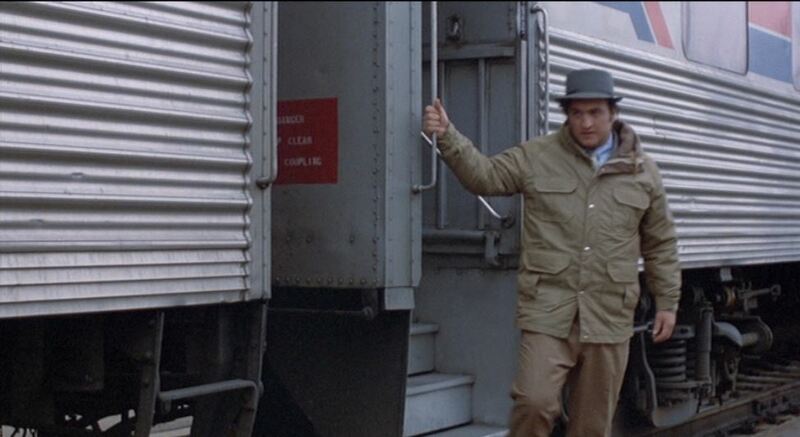 As the train rolls along, we see an early Amtrak conductor’s uniform modeled by actor Bill Henderson. Note the red stitching and wide lapels on the almost blue jean denim-like material. Very 70’s disco style! Our first, close-up view of the train’s motive power. Amtrak #702 is a GE P30CH “Pooch” built in August 1975. Meant for long distance service, this 3,000 hp, six-axle locomotive suffered lots of mechanical problems and was unpopular with operating crews. 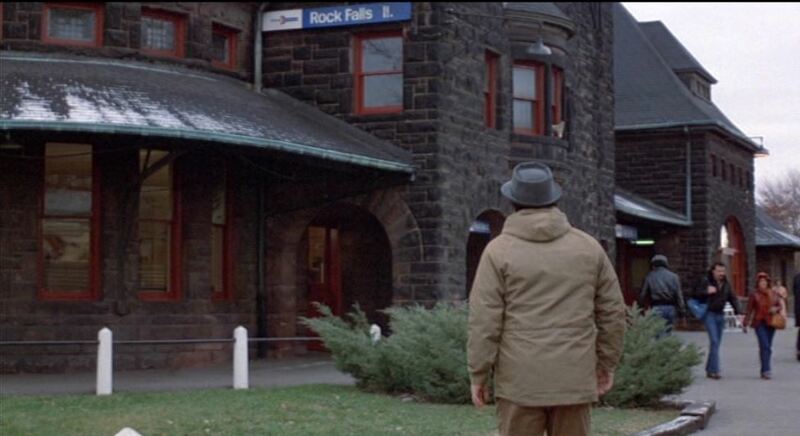 Ernie detrains at fictional “Rock Falls, Illinois”, supposedly the first stop outside Chicago. 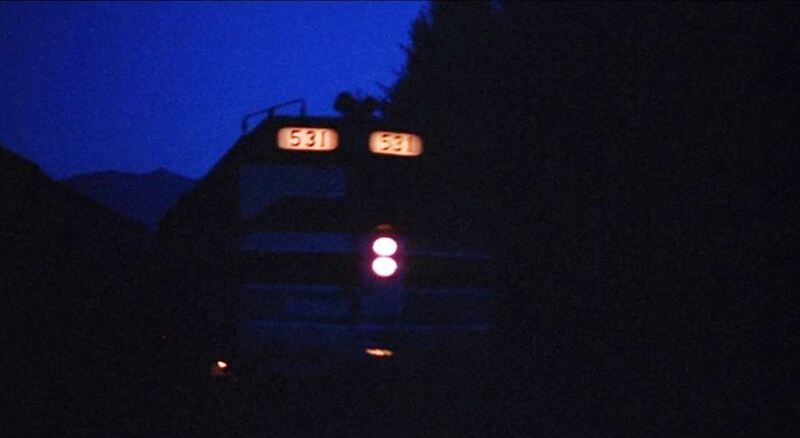 Nell is seen riding Amtrak #2553 “Central Park”, another ex-Rock Island sleeper #633 “Turquoise Sky”. 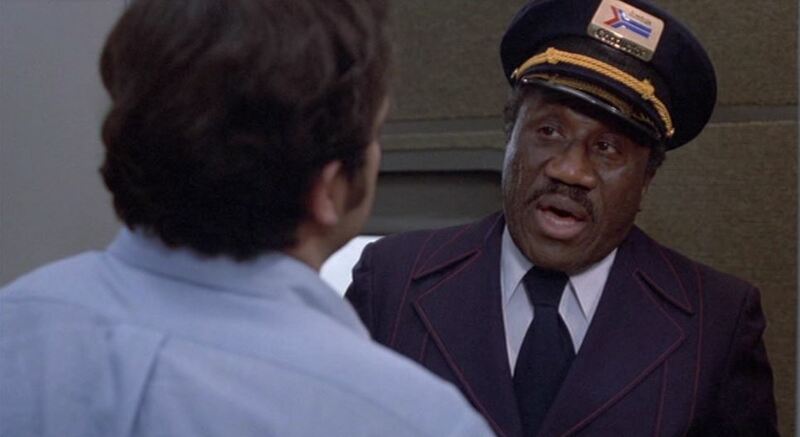 The depot is actually located at Kalamazoo, Michigan. 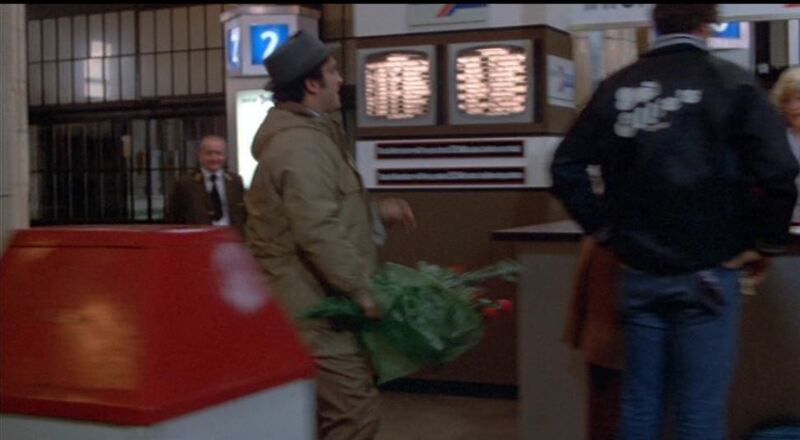 An announcement over the station’s PA system indicates this is Train #57. 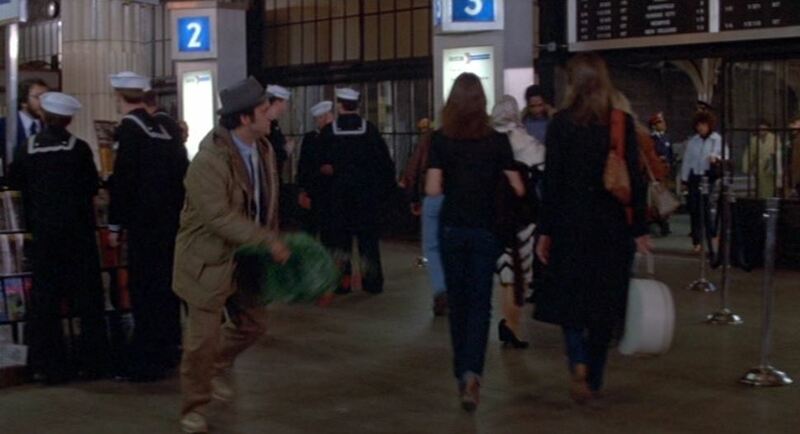 Suddenly, the train consist changes. 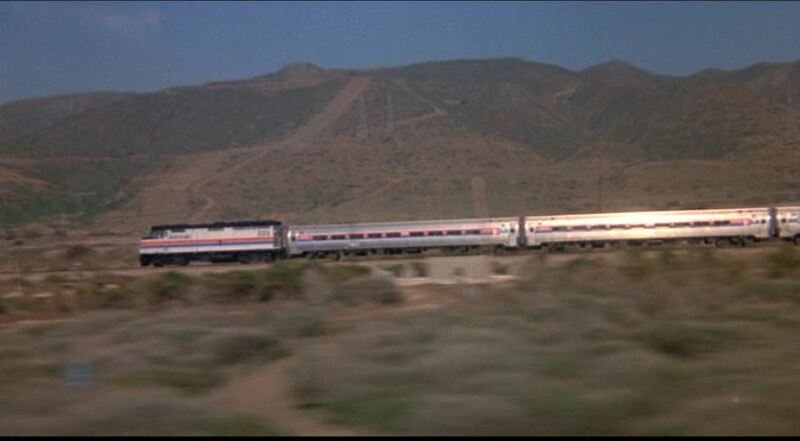 Now we see an Amtrak EMD F40PH engine pulling a string of Amfleet cars through what appears to be Southern California (probably on the LA-San Diego line alongside I-5). 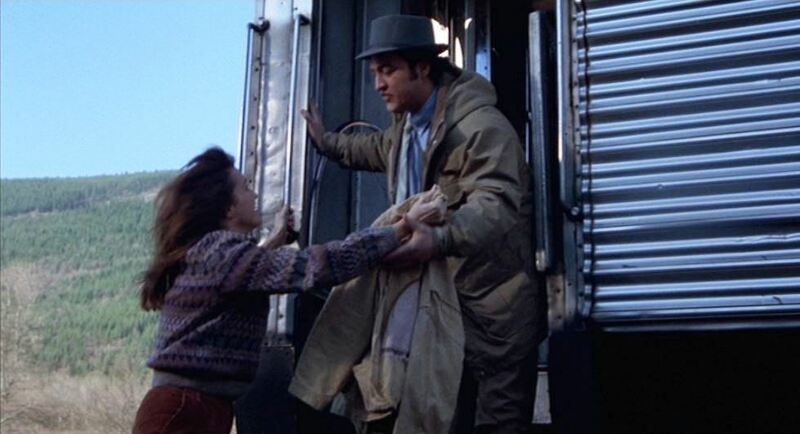 This exact clip was also used in the 1979 film, “Disaster On The Coastliner“. 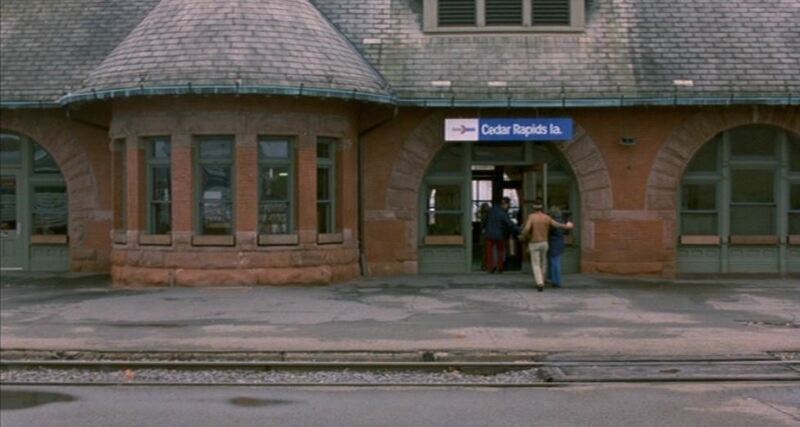 Once again, the Kalamazoo, Michigan depot (there’s no mistaking those turrets) stands in for the Cedar Rapids, Iowa stop. As night falls, there’s yet another consist change. 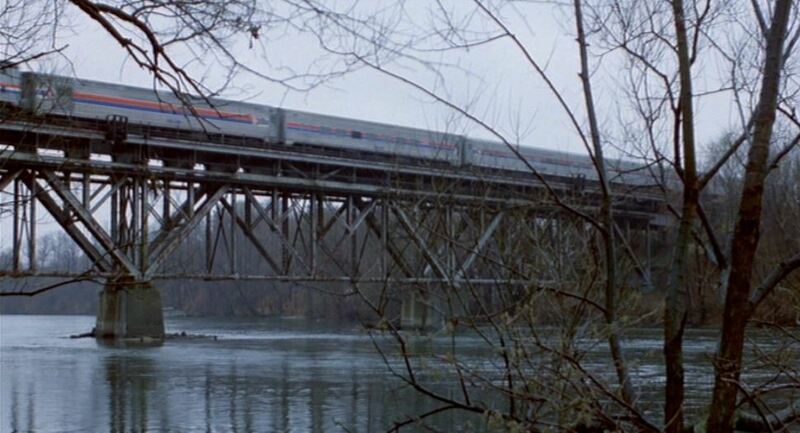 Now we see Amtrak #531, an EMD SDP40F leading a seven car train of “Heritage Fleet” sleepers. 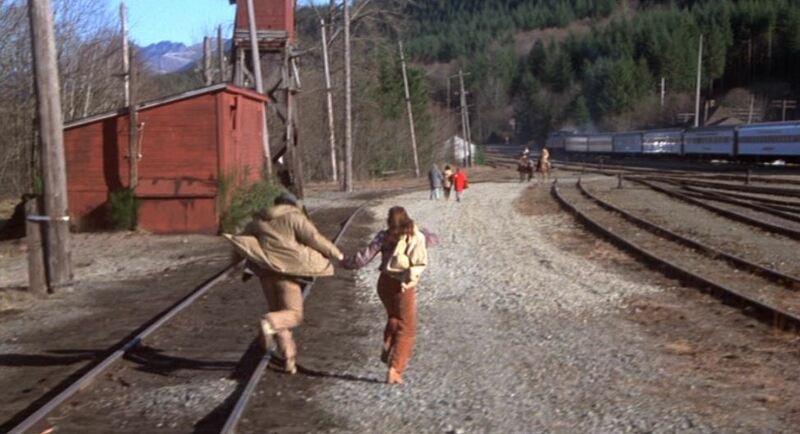 Ernie and Nell roll through what appears to be western Washington State. 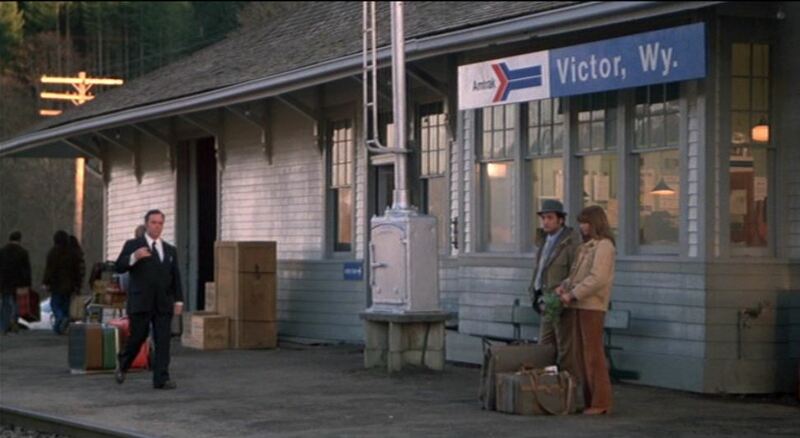 Comes the dawn, Ernie and Nell find themselves on the platform at Victor, Wyoming (Cedar Falls, WA). 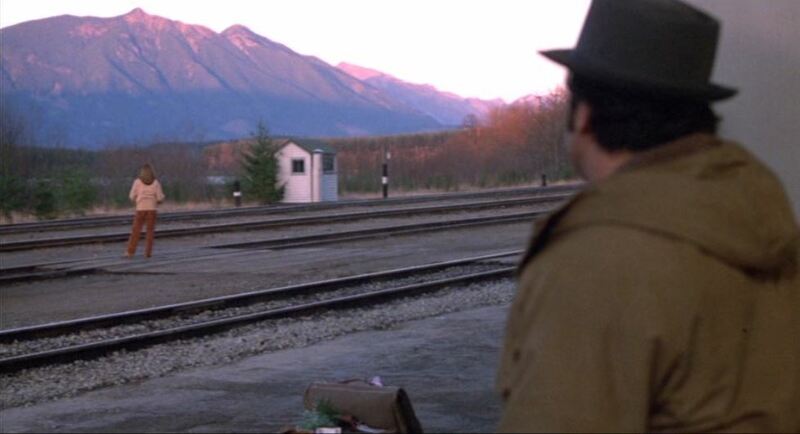 As the sun rises on the Cascade Mountain foothills, they have 30 minutes until Ernie’s train arrives to take him back to Chicago. 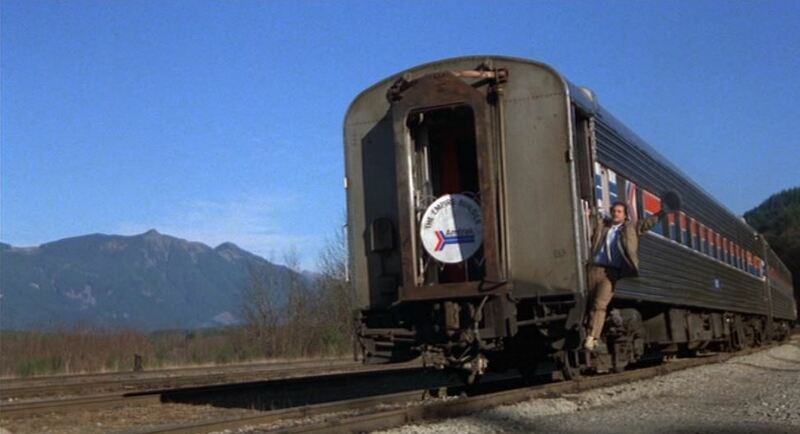 I believe that little building is a scale house to weigh freight cars. 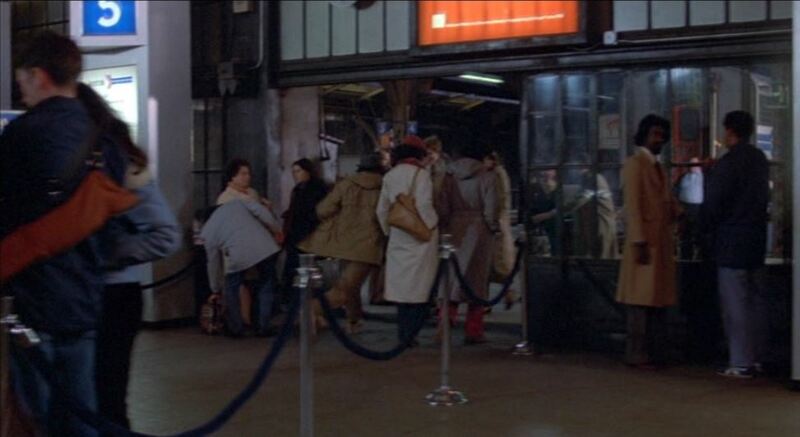 All too soon, they are running to put Ernie on his train. Nice view of the small rail yard at Cedar Falls. 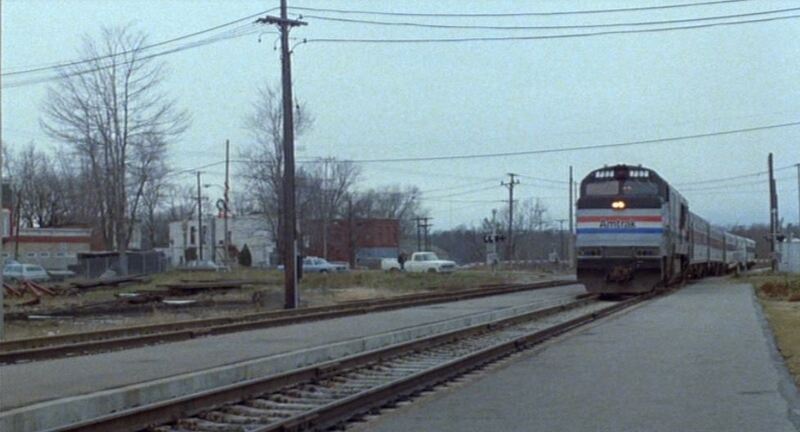 In a scene straight out of “Since You Went Away“, Ernie boards the eastbound as Nell runs alongside. 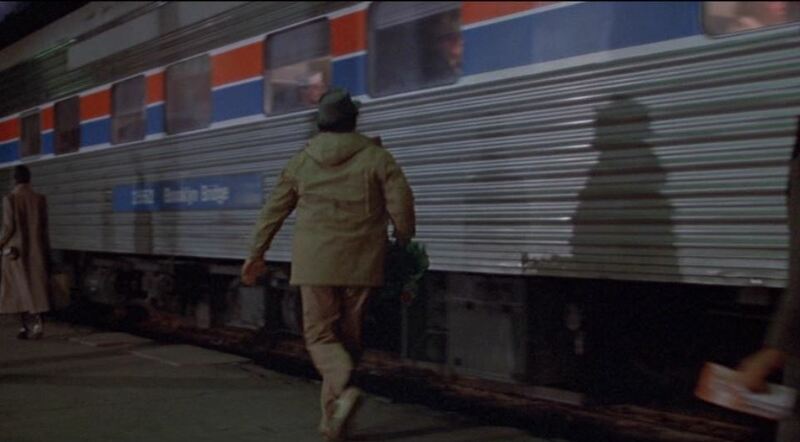 The moviemakers even tacked an enormous Amtrak “Empire Builder” drumhead on the rear door of the train. 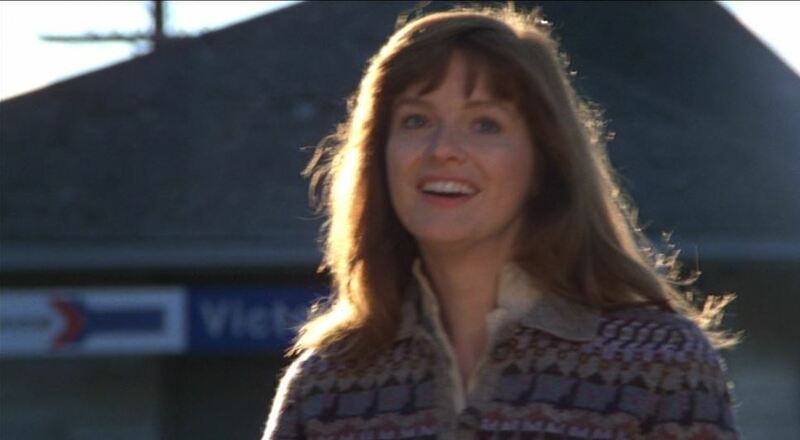 The movie concludes with a back-lit glam shot of actress Blair Brown (rawr-RAWR…). Continental Divide gives us a good glimpse of early Amtrak equipment and locomotives, most of which has since been retired/scrapped/replaced. 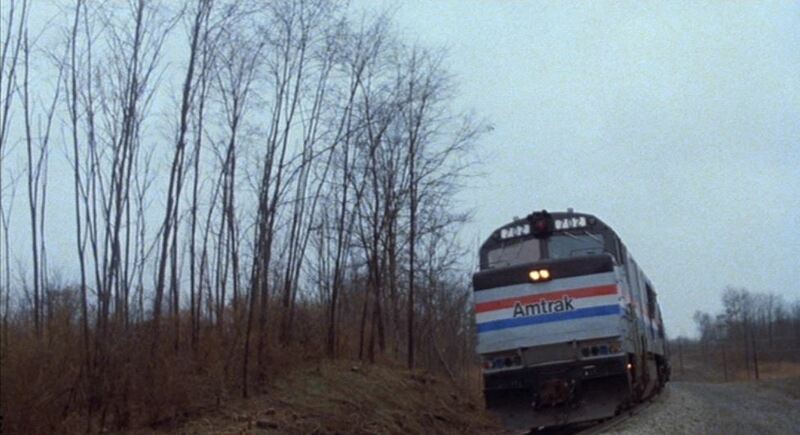 Even the yard at Cedar Falls has been pulled out with the line’s abandonment (shortly after filming wrapped) and replaced with a hiking trail. 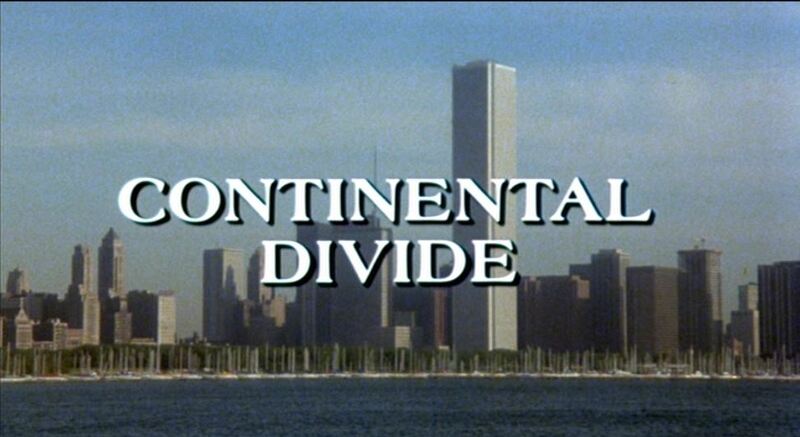 All-in-all, not a bad movie, although I must admit to fast-forwarding over the boring parts to get to my trains. 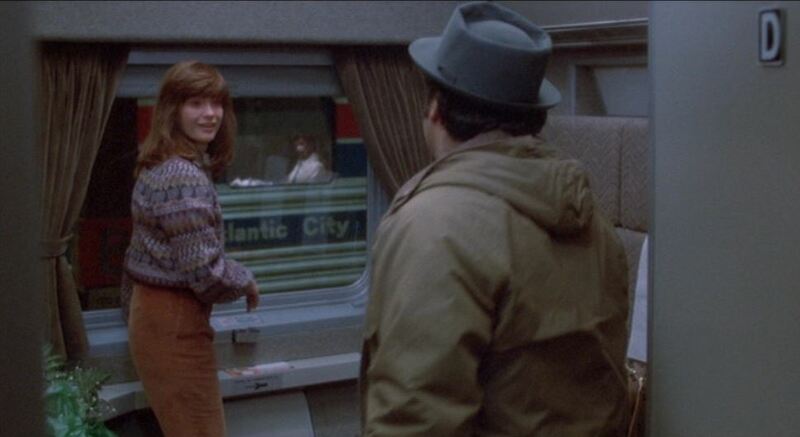 ;p All Aboard Amtrak! 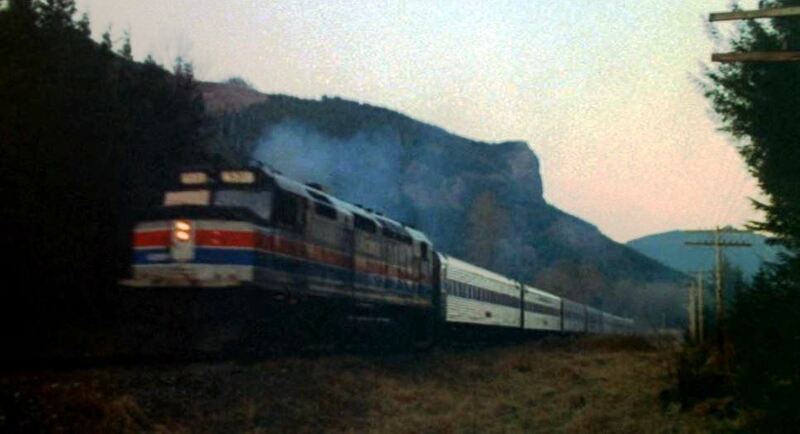 This entry was posted in Uncategorized and tagged Amtrak, Blair Brown, Cedar Falls Washington, Chicago, Chicago Milwaukee St. Paul & Pacific Railroad, Chicago Union Station, Continental Divide, Disaster on the Coastliner, EMD F40PH, EMD SDP40F, GE P30CH Pooch, Heritage Fleet, John Belushi, Kalamazoo Michigan, Pacific Extension, Rock Island Railroad, Santa Fe Railway, The Milwaukee Road, Universal Pictures, Washington State. Bookmark the permalink.